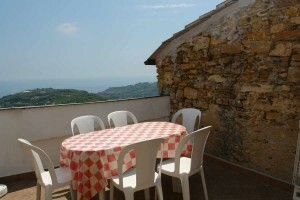 Discover the province of Imperia in Liguria and enjoy both seaside and mountain views! Therefore, you can see a number of olive and wine groves in almost every corner of Imperia. 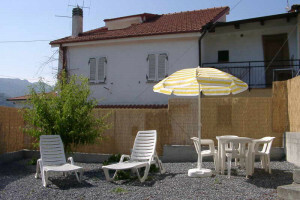 The groves on the slopes of Imperia characterize the landscape in Imperia. Do take a walk through the olive groves and admire old and traditional olive production plants and mills. and a valley of the same name. 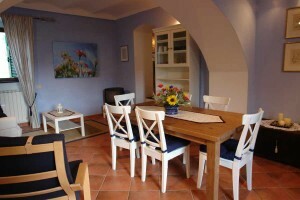 There you can relax in a quiet, beautiful natural setting, in forests, olive groves and meadows. The city of Dolcedo is particularly worth seeing in the Prino valley. You can visit the indigenous olive mills there, and taste the delicious olive oil right at the place of production. Many of the villages offer a wonderful view of the coast and the Mediterranean Sea. 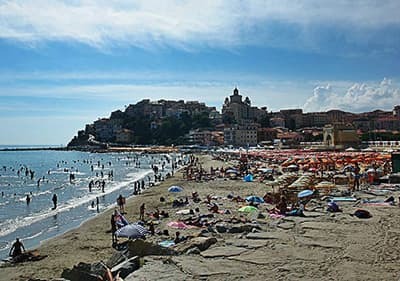 There are not only wonderful mountain landscapes in Imperia, but also fantastic beaches. 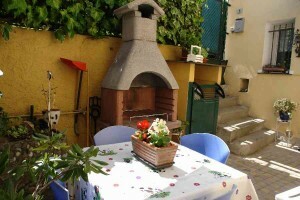 In addition to that, the most beautiful holiday destinations in Italy are located here. 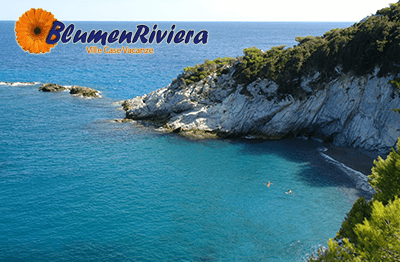 whose wonderful architecture and historic town centre from the Middle Ages attract many tourists, and the provincial capital Imperia, are found right in the coastal region which bears the name Blumenriviera. 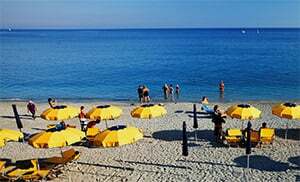 Fantastic beaches and the clean Mediterranean Sea are an ideal place for restful beach holidays. Stroll through small perfectly located beaches in secluded bays, and go for a swim in a crystal-clear, refreshing sea, whose water has been distinguished almost everywhere for its high quality. 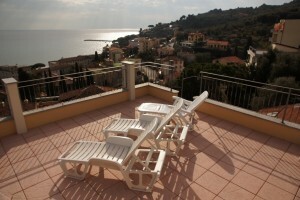 Imperia also has a lot to offer from the culinary point of view. The food here is very diverse. Make sure you try the freshly produced olive oil, taste the exquisite wine and eat the most fresh fish and seafood right there by the sea. Try typical Ligurian cuisine, and taste the delicious Foccacia with cheese and tomatoes. Also marvel at the seemingly easy dishes like noodles with home-made Pesto. You can set out from the hilly hinterland on extensive hiking and exciting mountain bike tours. Climbers and free climbers too will find their Eldorado in Imperia. Exciting rocks and climbing tours beckon you for a climbing adventure. Take a stroll through fantastic towns which in most cases were already inhabited in the Middle Ages. Admire the centuries-old walls and well-maintained buildings. Many of the former castle complexes are still well-maintained even today and one can take a tour round them. Even historical ports in coastal towns are always worth a visit. You can experience a lot there too. The crystal-clear water makes Imperia an ideal destination for divers in particular. But even surfers will find the place full of fun. Culture enthusiasts will not get a raw deal in Imperia either. The numerous historical churches, most of which date back to the 15th and 16th centuries, and the historical castle facilities are the ideal destinations for all lovers of history. Admire the old paintings and statues in the churches, visit the olive museum and historical olive oil mills. You will also find some remains from the Roman occupation here. Old bridges, fountains and streets are waiting for you to make a discovery tour. 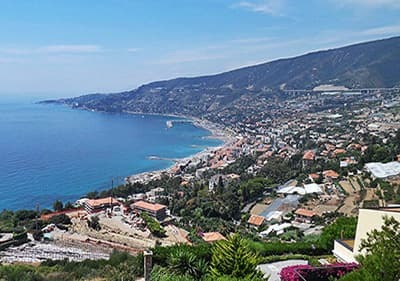 When you are in Imperia, you can get from the coast to the hilly countryside in just a few minutes by car, and vice-versa. You will never feel bored in this place!